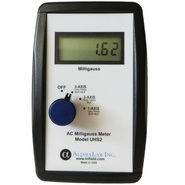 Recommending an EMF meter depends your needs. Do you need to test nearby power line energy? You’d want a gauss meter. Do you need to measure the nearby cell transmitters? You’d want want an RF meter. Are you an amateur EMF tester or an aspiring professional EMF technician? You can purchase our favorite meters, EMF kits, and shielding products, at the best prices in North America from our Affiliate Partner Safe Living Technologies. You can get EMF Testing Lessons from us via FaceTime or Skype. Check out of Virtual EMF Testing program. Inquire via our contact page. High frequency transient analysis for "Dirty Electricity"
Calibrated in factory by Gigahertz Solutions. Traceably calibrated laboratory measurement equipment was used from Anritsu, Rohde & Schwarz and IFR (former Marconi) using the internationally accepted “Absolute –Method” for the antenna. The final test prior to dispatch verifies compliance to specifications in every respect. NIMH provides up to 7 hours continuous use with Log Per Antenna *Note* With the UBB27 Antenna the continuous use battery life will be reduced to approximately 4 hours. When you enter Elexana-SLT into the code box while checking out, you will receive a 5% additional discount. You can get EMF Testing Lessons from us via FaceTime or Skype. Inquire through our contact page.